Faith is the first and fundamental virtue on which all the remaining virtues are supported as if it were a foundation. Faith is not a duty. It is an experience and emotion. There is a close relation between the ability to believe in God and His healing power. Many studies refer to the relationship concerning the religious faith and the healing power with several diseases. Purpose: The purpose of the present study is the investigation of the relationship between the conscious faith and the prevalence of the coronary diseases. Material – Method: 481 Greek Orthodox citizens took part in the study. 85% were residents of Athens and the 15% were residents of the provinces. 60% of the sample were women and 40% were men. For the requirements of the data’s statistical analysis the population of the study was separated into two groups, the conscious faithful (group A) and the faithful according to family tradition (group B). A self?completed questionnaire of 38 closed?type questions was used for the selection of information. The questions were related to religious faith and the existence or non?existence of coronary artery disease. Results: The study showed that: 84% of the sample believes in God consciously, 47% of group A and 18% of group B (p<0.001) prays a lot, and finally the faith in God helps in health problems, as 42% of group A and 20% of group B (p<0.001) supports. 32.5% of the total amount of those asked fasts consciously. In a multifactorial analysis, where the existence of coronary artery disease constitutes an independent variable and the predisposing risk factors as well as the conscious fasting constitute the dependent variable, the factor «conscious fasting» is an independent negative index of occurrence of coronary artery disease (CAD). Conclusions: To conclude, it seems that the factor «conscious fasting » is an independent negative index of occurrence of coronary artery disease (CAD). Faith is the first and fundamental virtue on which all the remaining virtues are supported as if it were a foundation. «Faith attributes substance, to things one cannot see»  according to St. Paul (Apostle). Faith is proof of things, which are not seen with a naked eye, but faith convinces a believer about them as if he was seeing them and perceived them with physical senses. According to this definition faith is the gate through which we come into the secret sphere of religious truths and which we learn about with divine revelation and we do believe by not relying on positive evidence but on the authenticity of God.1 Without the sense of a typical compliance to some denomination, but with the sense of actual profound devotion to some spiritual principles faith is not something that is obvious, because a man carries out his religious duties. Faith is not a duty. It is an experience and emotion. It is a gift and is cultivated as such, but not in the way we may think. There is a close relation between the ability to believe in God and His healing power and the ability to also believe in other things. Many studies refer to the relationship concerning the religious faith and the healing power with several diseases. The results of research lead to the conclusion that faith in God is the most important factor, which helps the patients with their coping with their disease. The religious consciousness has been found to be related to less stress and depression and a more powerful immune system. Spirituality involves a greater resistance and sturdiness regarding diseases which have to do with stress. Religious faith influences the behaviour of the people on all levels and whatever relates to whatever relates to health. The cardiovascular diseases remain one of the main causes of death in the industrial nations and in our country. The coronary artery disease constitutes the primary cause of death in the contemporary western societies and is due in the majority of cases to stenotic lesions of the coronary arteries due to atheromatic plaques. The extent to which and how the religious faith is related to the prevalence of the coronary diseases in the Greek population or to what extent it can prove to be a preventive measure and a better outcome (diagnosed disease) is tried to be looked into by the specific study. The purpose of the research was the investigation of the relationship, which might as well exist, between behavior patterns, which constitute the outcome of religious faith, and coronary diseases. The population of the study was consisted of 481 Greek citizens. The selection of the sample was random. d. Questions related to health behaviour (8). The quantitative demographic characteristics are presented as mean value (± SD) while the qualitative as percentages on the sample. The x²‐test was used for the comparison of the answers among the groups of the sample. The influence of the religious consciousness on the appearance of the coronary artery disease was studied on a multi factor analysis (binary logistic regression), where the coronary artery disease was the independent variable and the predisposing factors of the coronary artery disease as well as the conscious fasting were the dependent variables. According to our opinion from the analysis of some of the important facts of the research, we gather that: the majority of those asked which is 84% states that it believes consciously in God and only 13.3% believes according to family tradition. 52.8% believes in life after death (the remaining did not know and did not answer). As for the question do you pray to God: 4.7% says not at all, 32.6% a little, 42.25% a lot and 20.4% states that it prays really a lot. 24.2% is a very and a really vary frequent churchgoer, 75.3% does not attend church that frequently or not at all and the rest did not respond. How much does God contribute to the good outcome of health problems? : 8.7% responds that He does not at all, 24.5% responds a little, 38.5% responds a lot, 25.8% responds very much. How much did faith in God, during their hospitalization in a Hospital, function positively? : 8.5% answered no, 55.5% answered yes, the remaining did not answer. The 31.2% of the sample follows all the religious fasting, the 52.6% follows some of them and the 13.7% follows none of them. What is the reason for which they fast? 32.5% said that it has been scheduled by the Church, 21.4% according to family tradition, 6% for health reasons, 18.9% for abstinence and 0.6% because it is imposed. The comparison of results was made between those who believe consciously and those who believe according to family tradition. From this point on, the conscious faithful will be called group A and those according to family tradition will be called group B. The answers are mentioned in table 6. 58.3% of group A and 30.6% of group B believe in life after death with a significant difference ρ<0.001. 46.9% of group A and 17.5% of group B pray a lot and the difference is ρ<0.001. By praying 45.9% of group A and 27.9% of group B feel better, revealing a statistically significant difference ρ<0.001. 77.8% of group A and 51.9% of group B is a churchgoer out of necessity with a statistically significant difference ρ<0.001 concerning the answers given between the two groups. Faith in God contributes to the resolution of their problems is what 47.3% of group A and 17.2% of group B support with a significant difference ρ<0.001. 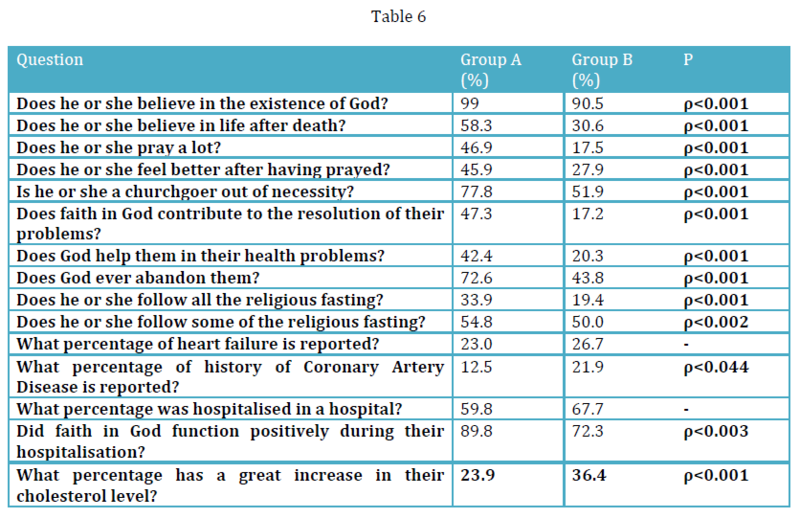 42.4% of group A and 20.3% of group B believe that God helps in their health problems with a difference ρ<0.001, however 22.6% of group A and 43.8% of group B believe he helps somehow by revealing a statistically significant difference ρ<0.001. 72.6% of group A and 43.8% of group B considers that God does not abandon them with a difference ρ<0.001. 33.9% of group A follows all the religious fasting and 54.8% of the same group follows some of them with a statistically significant difference ρ<0.001 and ρ<0.002 respectively in relation to those values of group B. 87.5% of group A and 78.1% of group B has not mentioned any history of coronary artery disease with a difference P<0.044. 23.9% of the first group and 36.4% of the second group reports the existence of increased cholesterol with a difference ρ<0.001. The overwhelming majority of those questioned (84%) believes consciously in God, but almost half prays a lot (46.9%). The answers themselves reveal a variation because conscious faith is strictly connected to daily prayer. The Lord himself prays and incites his disciplines to do that. [9,10] Vasilios the Great makes reference as to praying. [11,12] Although the population of the study states that it believes consciously, it seems that it is not satisfactorily aware of issues concerning faith or it seems that there is a wrong opinion on issues of prayer and it connects prayer only to the simultaneous presence in the temple. Research conducted abroad showed that prayer, faith and in general religion is related to good mental health, even faith has the greatest connection to the most positive mental health.13 Praying contributes to the reduction of the activity of the tone of the sympathetic neural system, reduces the muscular tension, the secretion of hormones from the pituitary gland, the arterial pressure and the cardiac rhythm. All of these effects contribute to good health. 47.3% and 42.4% respectively of group A and group B supports that faith in God contributes to the resolution of problems in general and those health problems in particular. As concerns another study in which 542 hospitalised patients took part, 455 stated that faith was the most important factor, which contributed to their dealing with their disease. Increased religiousness is connected with the lowest values of arterial pressure in a sample of 3,963 individuals. Those who believed consciously in God took their medication easily on a regular basis. However this cannot explain the differences that were found in the values of arterial pressure between those who stated increased religiousness and the team that was watching television or was listening to the radio (religious broadcasts) that had bigger values of arterial pressure. A small percentage (18.4%) of those who believe consciously is a churchgoer, which is a fact that certainly is divergent on the matter of conscious faith which is connected with the participation of the faithful in the Sacraments of the Church. 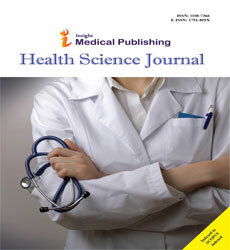 As for a research that was carried out on hospitalised patients with congestive heart failure or COPD 48% stated that it participates in religious events once or more than once per week and 70% stated that it prays and reads books of a religious content concluding that the participation in religious events was inversely proportional with the natural disease and disability and it guarantees greater social support. Concerning another study the relationship between the regular attendance at religious events and mortality, irrespective of the cause, was estimated. The individuals who participated in religious ceremonies had a smaller mortality in comparison to those who did not participate. 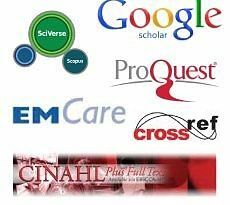 Research on 577 patients revealed that the negative relationship with religion is associated with a worse quality of life, poorer natural health and a greater depression whereas a positive relationship is associated with better mental and physical health and another study mentions that the participation in organised religious events is associated with better health, social support and prosperity with a statistically significant difference (p=0.001) in relation to their not participating. At a higher percentage the result referred to women and the elderly over 75 years of age. While in church man receives the offering and Vasilios the Great mentions that the offering is superior to a miracle. The majority of group A responds by saying that God will not abandon them. A research which was carried out in the USA under the subject «when religious convictions have great impacts on our health» mentions that patients who considered that God was punishing them, that God had abandoned them, that God did not love them, that God did not have the power to help them or felt that church had abandoned them had a greater mortality (19%‐28%) after their leaving the hospital. All the religious fasting is followed by 33.9% of group A. Vasilios the Great mentioned the beneficial influences of fasting. Nutrition has been associated with different health problems. The great content in fat leads to a high level of cholesterol, which is associated with the outbreak and the progress of the cardiac diseases. The increased intake of food causes obesity that is associated with sudden death. The relationship between nutrition and cardiac diseases is not questioned and the beneficial influences of the Mediterranean diet are known for the prevention of coronary artery diseases. The population of our study and the group of the conscious faithful reveals smaller percentages of coronary diseases and a high level of cholesterol with regard to the group which believes according to family tradition. Research that was carried out abroad showed that religion contributes to the reduction of unhealthy behavior. Research that was carried out on 3,968 individuals showed that increased religiousness is associated inversely proportional with smoking and even those who believe easily quit smoking and they hesitate to pick up the same habit. Smoking leads to the predisposition towards the appearance of coronary diseases. Lower values of cholesterol which the specific sample reveals are possible due to the avoidance of «excesses» such as smoking, consumption of alcohol, consumption of food with animal fat and so on. In our study in which variables associated with religious faith, conscious fasting and the impact of coronary artery disease were assessed and also in a multi factor analysis where the existence of coronary artery disease constitutes an independent variable and the predisposing risk factors as well as the conscious fasting constitute the dependent variables, it seems that the Conscious Religiousness factor as it is expressed as « conscious fasting » is an independent negative index of occurrence of coronary artery disease (C.A.D). [Exp(B)=0.75, 95% CI=0.58‐0.98, p=0.036]. James W.Jones. Religion, Health, and the Psychology of Religion: How the Research on Religion and Health Helps us Understand Religion. Journal of Religion and Health, Vol 43, No 4, 2004. Great Vasilios. Epistle 150, EPE 1,114.PG 32,603B. Koening, H.G. Kvale, J.N., & Ferrel, C. Religion and well being in later life. The Ggerodologist. 1998, 28, 18 28. Pargament, KI, Koening HG, Tarakeshwar, N, Hahn, J. Religious struggle as a predictor of mortality among medically ill elderly patients:A two year longitudinal study. Archives of Internal Medicine, 2001, 161Q1881‐1885.